« Why Is Obama Administration So Reluctant to Criticize Ethiopia’s Repression? Making its World Premiere at the ongoing 2015 Cannes Film Festival is Yared Zeleke’s coming-of-age drama, “Lamb,” which marks the very first time in Cannes Film Festival history that an Ethiopian film has screened as an “Official Selection.” The country doesn’t have as rich a cinema history as one might immediately assume, with really 3 key filmmakers dominating the landscape – Haile Gerima likely being the most internationally-known, as well as Yemane Demissie and Teshome Kebede Theodros, all combining for about 10 feature films made between the mid-1970s through just before the turn of the century. Although, as covered on this blog in recent years, there continue to be young up-and-coming Ethiopian filmmakers, embracing the opportunities to create that come courtesy of the democratization of the production process, provided by evolving technologies – Yidnekachew Shumete (“Nishan”) and Zeresenay Mehari (“Difret”) are just 2 of the most recent, whose films have traveled, and that we continue to follow. And then there are co-productions like “Crumbs,” the Spanish-Ethiopian post-apocalyptic feature film that will be making ts North American premiere at the LAFF in June. 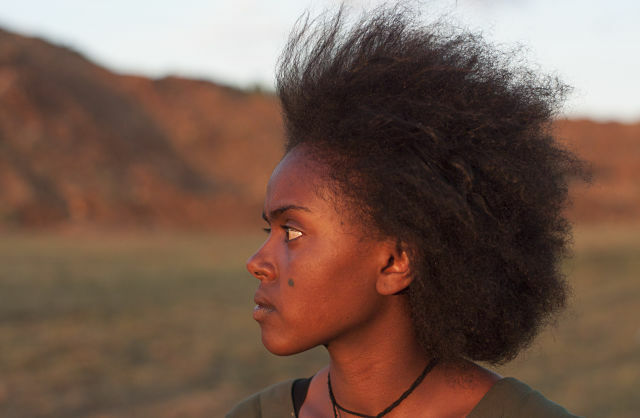 There is also “Beti and Amare,” the part sci-fi/fantasy, and part historical romantic drama set in World War 2-torn Ethiopia, directed by German filmmaker Andy Siege, which continues to tour the international film festival circuit. Yared Zeleke and his 2015 Cannes selection, “Lamb,” can now be added to that growing list. The film hails from Slum Kid Films, an Ethiopia-based film production company co-founded by Ama Ampadu, which aims to discover and nurture emerging talent in Ethiopia, as well as to support the development of Ethiopian filmmaking. “Lamb” tells the tale of nine-year-old Ephraim and his constant companion, a sheep named Chuni. Ephraim’s affection for Chuni deepen after he loses his mother to famine. Consequently, his beloved father sends him and Chuni far away from their drought-stricken homeland, to live with distant relatives in a greener part of the country. Ephraim soon becomes a homesick outcast who is always getting into trouble. When his uncle orders him to slaughter Chuni for the upcoming holiday feast, Ephraim devises a devious scheme to save the sheep and return to his father’s home.